Scroll down to see upcoming speaking engagements. Who am I? : I am a lover of faith, culture, African diaspora studies, world languages, and social justice. I cross borders, barriers, and barrios to actively engage the work of equity and inclusion. I am a frequent public speaker (see testimonials here) who is energized by presenting research on the African diaspora and diversity. I am also a writer and essayist. Life has given me an abundance of material; therefore, I write about what I see, live, and breathe. I pray that my work will heal divisions and mend brokenness. Click here to read more (biography 2nd paragraph). My work often expounds upon the following topics. Mission: May my work and my voice bring freedom to just one, be it through social justice, academic freedom, literary freedom, spiritual freedom, mental freedom, artistic freedom or otherwise. Krishauna published a chapter in the textbook Intercultural Communication for Global Engagement. Her chapter is titled Enacting agency: From culture shock to cultural broker. The full citation follows. Hines-Gaither, K. (2017). Enacting agency: From culture shock to cultural broker. In R. Williams Davis & A. Patterson-Masuko (Eds. ), Intercultural Communication for Global Engagement, (227-233). (2nd Ed.). Iowa: Kendall Hunt Publishing Company. CLICK HERE TO ARRANGE SPEAKING ENGAGEMENTS (See upcoming events below)! September 17, 2018 at 6:30pm eastern. Krishauna will present on innovative ways to incorporate Afro-Latinx pedagogy and social justice into the world language classroom. Title: One Classroom, Many Experiences: Incorporating Social Justice into the World Language Classroom. Description: The world language classroom is a prime location for incorporating social justice and culturally responsive lessons. The intersections of identity (race, class, religion, and gender, etc.) represented throughout Latin America produce rich pedagogical possibilities for world language educators. This practical webinar will give participants tangible tools for incorporating Afro-Latinx and Afro-Francophone heritage, as well as other social identities. The presenter will offer materials in a fun, dynamic and engaging manner. Learn today, use tomorrow! Listen to Krishauna's interview with Becky Morales of Language Latte, a podcast for world language teachers. Podcast topic: Krishauna will speak on incorporating social justice, Afro-Latino and Afro-Francophone culture, and diversity into the World Language classroom. Krishauna will conduct a diversity and inclusion training for Habitat for Humanity Leadership Team (CEOs and Directors). Krishauna gave a presentation to Karen Spira's spanish class on the Afro-Cuban poet, Nicolás Guillén's Motivos de Son. Krishauna conducted a diversity and inclusion training for Habitat for Humanity Staff. Krishauna will facilitate a discussion on the Chalottesville, VA riot to a consortium of local houses of worship. She will offer tools for church leadership to be able to organize similar conversations for their congregations. Organized by Jen Barber, of FREE Life Group. September 18, 2017, 6:00-8:00pm, Agape Faith Church. September 12, 2017 at 7:30pm eastern. The 77th annual convention will be held April 5-8, 2017 at the University of Missouri. This webinar provides an overview of how educators can engage all learners through culturally responsive and critical pedagogy. This webinar provides strategies for incorporating topics of race, class and gender into the world language classroom. Special attention will be given to Afro-Latino cultures. Webinar attendees will leave with a wealth of resources and ideas to use on Monday morning. Examples will be given in English and Spanish. Dr. Ashauna Harris, Harris Consulting, LLC. They Are We tells the extraordinary story of cultural endurance and reunion between the Gangá-Longobá, a small Afro-Cuban ethnic group, and their ancestral family in a remote village in Sierra Leone. Separated by the brutalities of the Atlantic Slave Trade, the two groups were finally brought together in 2013 by Emma Christopher, who discovered their connection via customary songs and dances. They Are We depicts this reunion and the rich exchanges between Cuban and Sierra Leonean culture. Krishauna Hines-Gaither, director of diversity and inclusiveness at Salem College, and co-author of the Vanderbilt University Center for Latin American Studies' educator guide for the film, will give introductory remarks. Christopher, currently on the faculty at the University of Sydney in Australia, will remotely give remarks. The film screening will last approximately eighty minutes. Krishauna presented recent interviews conducted with Afro-Garífuna women of Livingston and Puerto Barrios, Guatemala. The Garífunas are descendants of Africans who were trafficked during the Trans-Atlantic slave trade. The vessel transporting them shipwrecked in the Caribbean islands and the surviving Africans escaped. They soon aligned with the indigenous inhabitants of the islands. After centuries of battles and conflicts with the indigenous people, the Spanish, the English, and the French, the Garífunas were banished from St. Vincent and relocated to Central America in the 1790s. The Garífunas have maintained the distinct language, culture, and customs of their ancestors. Come hear this fascinating account of lesser-known Latin-American history. On Friday, April 8, 2016 (1:30pm) Krishauna will present the following paper at the convention of the College Language Association: Garífuna Women of Guatemala: Narratives of Resistance and Pride. At the same conference she will also chair a session titled Negotiating Power, Identity, and Visibility in the Afro-Hispanic World and Works. Krishauna will attend the ACPA Conference on Diversity and Inclusion in Montreal Canada. Title/Description: Afro-Latino Heritage for the World Language Classroom: This webinar provides an overview of how educators can engage all learners through culturally responsive and critical pedagogy. This webinar provides strategies for incorporating topics of race, class and gender into the world language classroom. Special attention will be given to Afro-Latino cultures. Webinar attendees will leave with a wealth of resources and ideas to use on Monday morning. Examples will be given in English and Spanish. Krishauna will give the following presentation at the annual conference of the Foreign Language Association of NC. Schedule: Saturday, October 24, 2015 8:30AM-9:20AM (Round 6); Title: Recharge Your Battery Here: Plug in to Innovative Language Lessons! Description: Engage diverse learners with multicultural lessons. Tried, true, and NEW methods for all levels (technology, games, poetry, film, music, oral, aural, kinesthetic and more). Keep 'em movin', keep 'em speakin', keep'em learnin'! No expertise needed, only a heart to reach all-teach all. Learn to incorporate fun & engaging activities as well as culturally thematic units. BONUS! Also receive innovative ideas on Afro-Hispanic & Afro-Francophone units. Come today, use tomorrow! October 13, 2015: Double showing at 12:15pm (Club Dining Room) and later at 4:30pm (Shirley Auditorium). Thanks you so much for your wonderful lunch-time talk today. It was informative, engaging, and thought-provoking-- and very well done. Thank you, Krishauna, for an absolutely fascinating talk this afternoon! I really enjoyed that and found it immensely worthwhile. KHG--You did yourself proud in your presentations (and research)-you were poised, professional, and very much in command of your material. Congratulations ! Fue muy grato verla y felicidades en todos los logros que está cumpliendo. Que Dios la bendiga mucho y que sigan los éxitos! Kudos on a wonderful presentation of your research. You held your audience completely captive. Enjoyed every moment! (L-R) Husband, Julián Gaither, Dr. Hines-Gaither, Father, Kacie Moore Jr.
Dr. Cabral reads her original poetry in Spanish. Dr. Krishauna Hines-Gaither reads English translations. (June) 2015 Conference on Second Languages and Cultures at 2015 AP Spanish Reading, Cincinnati, OH. Krishauna presented her dissertation research titled Negotiations of Race, Class, and Gender Among Afro-Latina Women Immigrants to the Southern United States. Conference is hosted by Tulane University, March 26-29, 2014, in New Orleans, LA. The selected venue is the New Orleans Downtown Marriott at the Convention Center. Theme: Cross-cultural awareness and sensitivity related to the concept of humor: How to navigate humor when interacting with international cultures. Program Description: ACTFL African-American Students SIG Business Meeting, plus special speaker Krishauna Hines-Gaither, with a Q&A period on Effective Best Practices, Strategies and Resources for attracting and retaining African-American WL learners, in all levels of instruction. October 12, 2013 Annual Fall Conference of the Foreign Language Association of N.C. Presentation Title: Sound the Alarm: Explosive world language lessons in progress. Salem student, Sara Lee Tolbert, assisted me with the presentation. She shared her experiences as a mixed raced woman ( Puerto Rican/Boricua Mother, Liberian Father). Calvary Baptist Church, Winston-Salem, NC, July 9, 2013 at 7pm. Testimonial: Te felicito por tu presentación inconmensurable! No solamente has tenido un aforo repleto, sino que además, has conseguido mantener al público totalmente interesado con tu información pero también, tu sentido del humor y la interacción con las alumnas- Dr. Ana León-Távora. (I applaud you for an unbelievable presentation! You not only had standing room only, but furthermore you managed to keep the audience completely engaged with your information, but also with your sense of humor and interaction with the students.) Dr. Ana León-Távora. (Kinkaid School.pdf) Click previous link for testimonial from The Kinkaid School, Texas (The year before Krishauna was invited, the Kinkaid speaker was Tony Plana (from television series, Ugly Betty), so needless to say, she was honored to be selected as their speaker the following year. KRISHAUNA NAMED 2013 N.C. HIGHER EDUCATION WORLD LANGUAGE TEACHER OF THE YEAR! CLICK HERE FOR ARTICLE PUBLISHED ON RESEARCH WITH BLACK WOMEN FROM HAITI, PANAMA & GHANA. 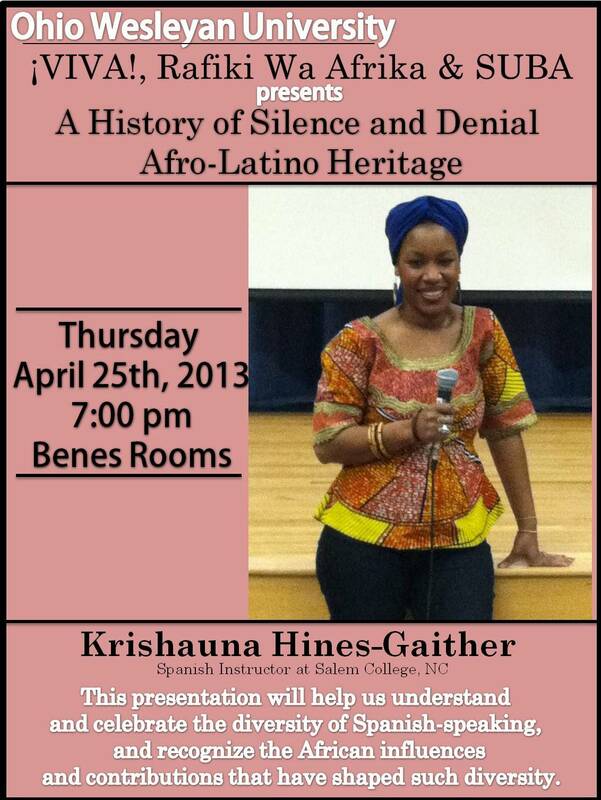 Performing original song written & arranged by Krishauna Hines-Gaither, while reciting Nicolás Guillén's Sensemayá. SUPPORT WRITERS! WE NEED YOU! Krishauna with students from HOLA, the Hispanic Club at Salem College. This is not an exhaustive list, but these are they who had an early impact on my writing.